Wish you all happy Sri Rama Navami. I bought soft poha this time. Couldn’t find hard one in the nearby Indian store. I knew pretty well that the soft poha could not be used to prepare avalakki (aval upma), still ended buying that! Luckily I remembered the aval payasam (poha kheer) that amma prepares for Janmashtami. We would be more interested in the bakshanam (sweets & savories) prepared for the festival that aval payasam would go unnoticed. Amma wouldn’t let us finish our dinner with tasting the kheer (customary that the sweet taste should linger in our mouth). We would plead amma to prepare this kheer in less quantity so that it wouldn’t be an issue to finish it off. I don’t remember relishing this kheer however well amma prepares it For a change I added date (khajur) to the kheer and it tasted heavenly. 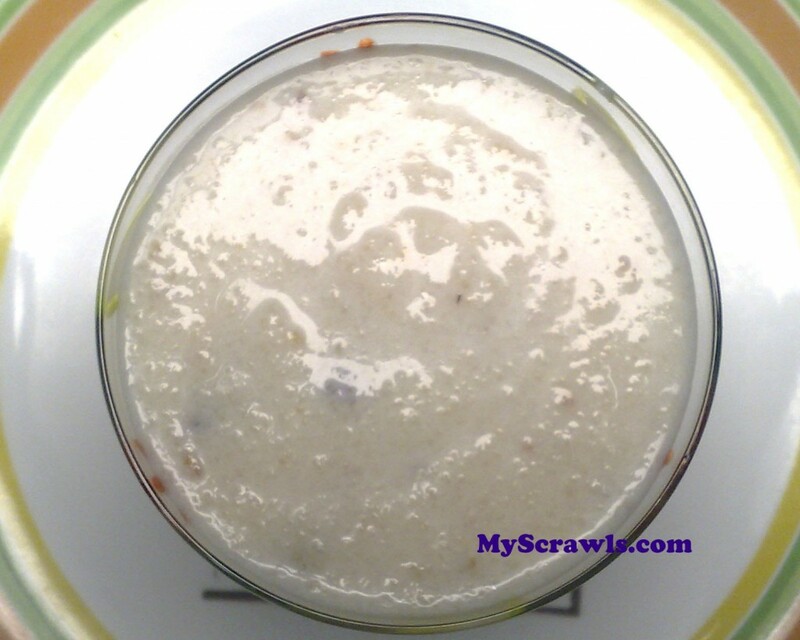 Here is my version of Poha khajur kheer or Aval Date payasam. Heat ghee and fry the aval till it turns light brownish in color. Coarsely grind aval and date in a mixer. Now add sugar and elachi powder. Once the sugar dissolves completely, add the aval date mix to the boiling milk. Allow it to cook for 3-4 mins. Remove it from the stove top. Heat ghee and fry cashews and raisins. Aval kheer with date tasted like “Appi payasa” (A dessert in kannada cuisine, will post it soon) or “Papada che Kheer” (in marathi). Aval payasam looks so delicious dear. Yummy! Thanks for visiting my blog anu…Payasam is looking yummy.. Delicious payasam Anu… I have never tasted poha payasam… sounds yumm! Payasam looks delicious Anu. Happy Srirama Navami to u too! Yummy! Looks lovely! Adding dates will surely give a wonderful flavour will try this version! Looks yummy,never heard of this will give a try……..
Love the addition of dates. thanks for dropping by my blog. First time here. Very nice recipes here..
yummy kheer.. addition of dates sounds interesting.. thanks for your compliments and calling me “veteran” blogger.. haha. i am still in the learning process dear. i like your recipe collection. Thanks for dropping by my blog. Liked your version with the addition of dates. You have a nice blog here.